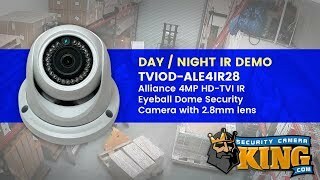 The Alliance series TVIOD-ALE4IR28 4MP camera with a 2.8mm lens is a great camera for use with TVI and AHD DVR recorders that have the ability to record at the 4MP resolution. With this HD analog camera, all you’ll need to connect is a good quality coaxial cable and 12V power supply. The 4MP resolution will have you in awe of the quality when you see the image and now, it will be even easier to identify a person committing a crime. You can even use these cameras at night and in dark areas thanks to the IR capabilities that allow you to see up to 65 feet even with those poor lighting conditions. Pair this camera with our JB-SB302 junction box for a clean weatherproof installation or, if you need a wall mount option, the WM-SB203 will make for a nice clean wall mounted weatherproof installation. This camera comes with FREE US based tech support and a complete 1 year warranty. I could tell out of the box that this camera would be a really good addition to our DVR system. However, we couldn't get a good image out of the box. It was my fault completely - we had just upgraded the DVR to a Sibell 32 channel (analog) and I failed to check the specs. The 4MP camera was not compatible. Customer support was stellar on this. They made my exchange process super simple and I had the proper 2MP camera in hand a few days later. We'll be purchasing more 2MP cameras very soon since that camera was perfectly compatible and proved to be an awesome upgrade to our existing system!